Although I've never understood why there aren't portable rotisseries at the Greenmarkets, finding a decent roast chicken in New York has never been difficult. Although I've never understood why there aren't portable rotisseries at the Greenmarkets, finding a decent roast chicken in New York has never been difficult. Depending on your budget there are lots of options, from Costco to Fairway and beyond. 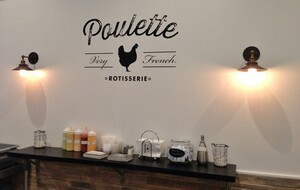 Recently the Accidental Locavore read about a new one that just happened to be in the neighborhood - Poulette. It was written up in French Morning NY and the owner is French, so it had to be good, right? I grabbed my BFF and we gave it a try a few nights ago. Poulette is a cute little black and white place, with a few tall tables and bar stools if you want to stay and eat (other options are take-out and delivery). 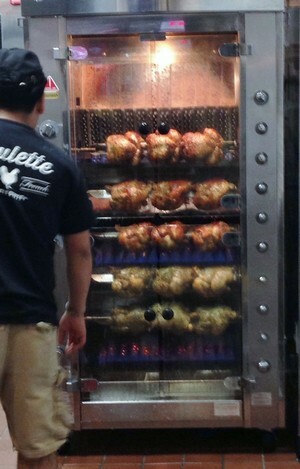 There's a big rotisserie behind the counter, filled with "free roaming" birds and that wonderful smell of roasting chicken. You have your choice of whole or half birds, with or without sides (there are also wings, a salad and sandwich, but you didn't come here for that, did you?). We decided to split a whole chicken, since roast chicken leftovers are a mainstay in my lunches, and add a couple of sides. Pretty soon pie tins were delivered to the table, some serving as plates, the rest held the chicken (quartered) Brussels sprouts and ratatouille. 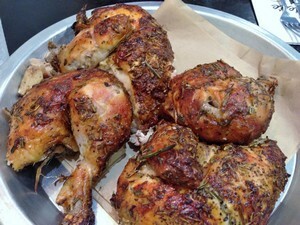 The chicken was perfectly roasted, with crisp herbed skin and moist meat (even the white meat). 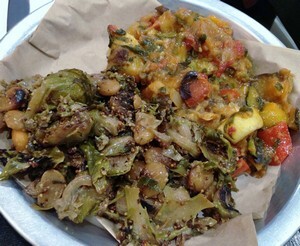 The Brussels sprouts were delicious, as was the ratatouille. Along one wall was a counter bearing condiments - a couple of different flavors of mayo along with Dijon mustard and ketchup. We tried an herbed mayo with the chicken, but it really didn't need it. Not wanting to waste the mayo, we decided to try the frites and ordered them for our idea of dessert. They were terrific. I'm not sure if they were twice-fried in the best French tradition, but they were perfectly cooked and went well with all the flavors of mayo (hey - sake of experimentation, ok?) but certainly didn't need them. There are other desserts on the menu, but we were full and satisfied. The next time the craving for a good poulet rôti hits, I know where I'm going.